Our mission in Rehabilitation is to approach and cope consistently, professionally, reliably and educate our patients' varied health needs. Each of our services is characterized by immediacy, correct assessment and correct approximation of the patient's overall condition, always in perfect and continuous cooperation with our Center's medical team (medical team, nursing staff, hydrotherapy team, and so on). We base our success on a fundamental principle: we set clear short-term and long-term recovery goals for every new outpatient or inpatient incidence. 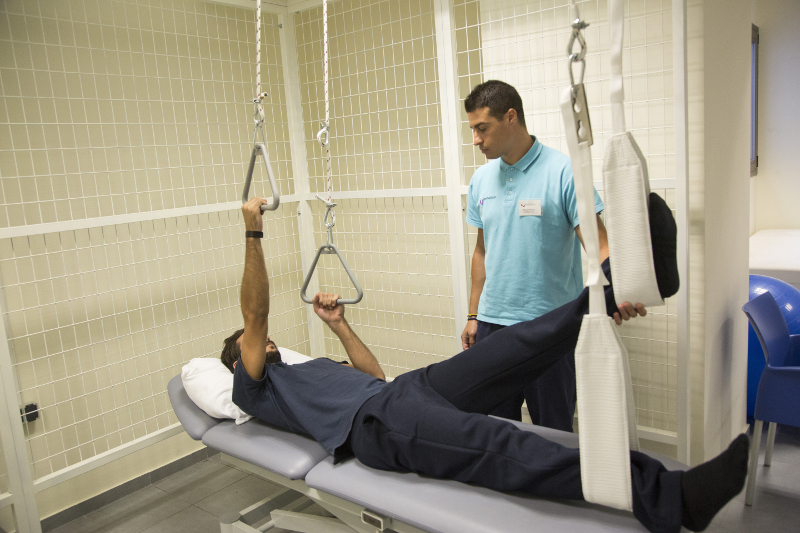 Physiotherapy is professional intervention aimed at the evolutionary retrieval of the person's functionality and / or the improvement of the person's mobility and coordination deficits due to disorders of the nervous, musculoskeletal, respiratory and cardiovascular system. A basic prerequisite for effective physiotherapy is the proper medical and physiotherapeutic assessment - approaching of patient's condition in order to set the goals of physiotherapeutic rehabilitation from the outset. Maintaining movement - force - coordination - propriety. Keeping motion of the joints. Obstruction of articular stiffness - kinesiotherapy. Treatment of swelling and inflammation (acute - subacute phase). Use of natural means - therapeutic ultrasound - diathermy. Recommendations for the prevention and obstruction of secondary injuries. Improvement of static and dynamic balance. Improved coordination - orientation and direction of motion statically. Weight control (supine, sitting, upright position). Personal hygiene training, clothing, footwear, diving, feeding and so on. Transport training of all levels (uprights to and from the seat - with return control). Training for the use of additional support aids. Orthopedic incidents: fractures, hip, knee and shoulder arthroplasty, injuries (acute / hypoxic phases), spine surgery - spinal deformities, amputations and so on. Neurological diseases, polyneuropathy, myopathies (Parkinson's disease, Multiple Sclerosis, Guillain Barre syndrome, etc.). Respiratory, urinary and cardiovascular diseases that affect the patient's physical condition and functionality for a long time. Oncology (post-operative stages or not). Elderly problems: reduced mobility, generalized weakness, patient care, chronic bedtime. Physiotherapy is based on scientific data that is enriched and renewed continuously with the valuable additions of research and experience. In Rehabilitation, we consider the holy right of the patient and our strong motivation to keep us informed about new developments so that we can provide you with the best possible healing work!